Are you up for a good soaking? If crawling behind waterfalls, jumping off ledges, crawling in and out of small caves and jumping into deep pools sounds good to you, then come and join us for some gorge walking! in a picturesque location near to the Ystradfellte Waterfalls. You will be equipped with wetsuit, buoyancy aid and helmet, and our experienced and dedicated instructors will guide you up the river where you will be introduced to traversing, jumps in to the river and swim across to the far side. Your day of gorge walking will continue with more traversing along rock walls, jumping across boulders, exploring dark holes in the ground (only for the intrepid), scrambling up waterfalls and crawling along narrow ledges behind the waterfall to find that the only way down is to jump in the pool on the far side. A day of adventurous gorge walking would not be complete without taking the plunge at “Loonies Leap” the 18ft jump! From there it's a short wet walk back to the minibus, where warm clothes wait. 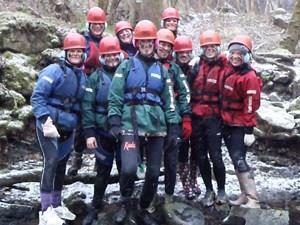 Gorge Walking/Canyoning in the Brecon beacons with black mountain.